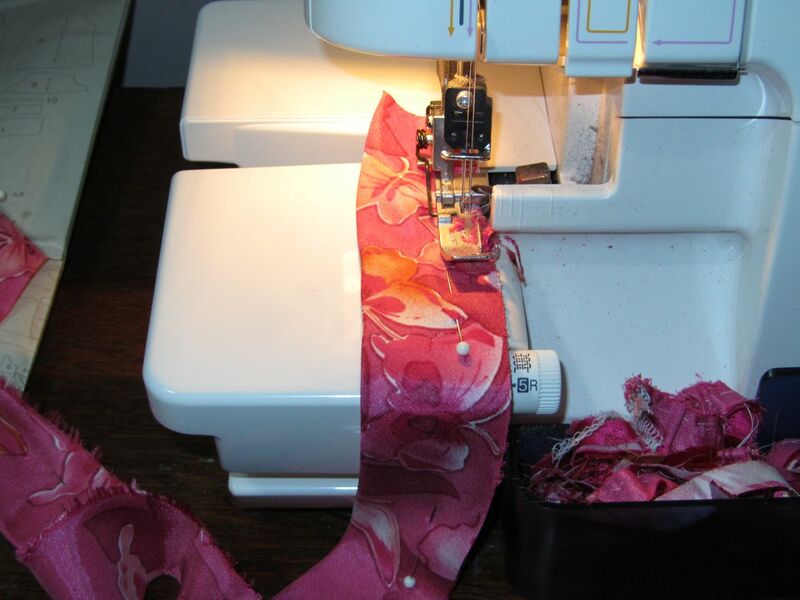 Here’s how I made a pink scarf headband from leftover fabric. 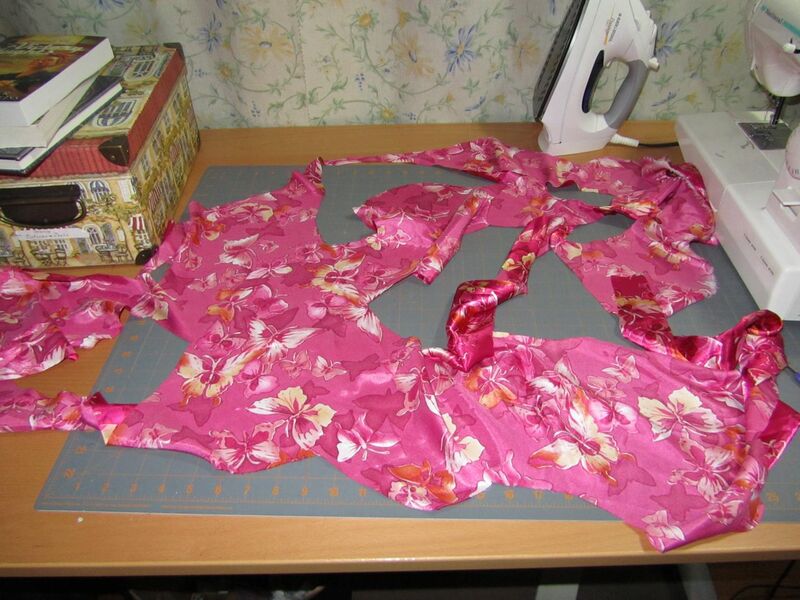 This was how the leftover fabric looked after I made a pink blouse. 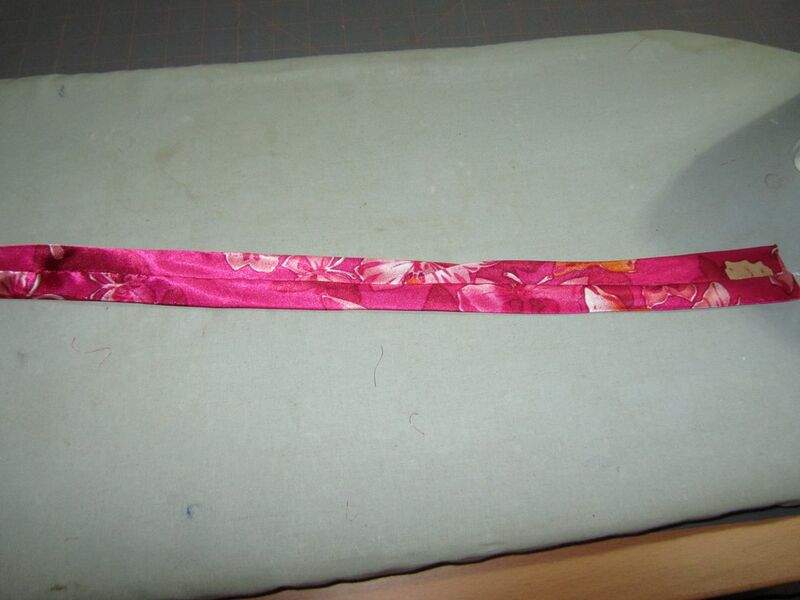 I wanted to make a matching headband that was from one long strip of fabric. 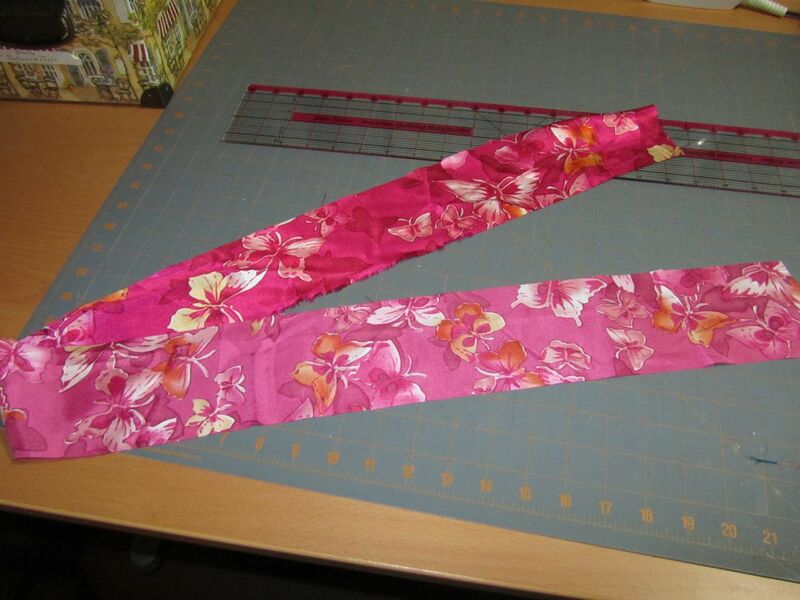 After folding the fabric in half, I used my quilting ruler to cut a long strip. 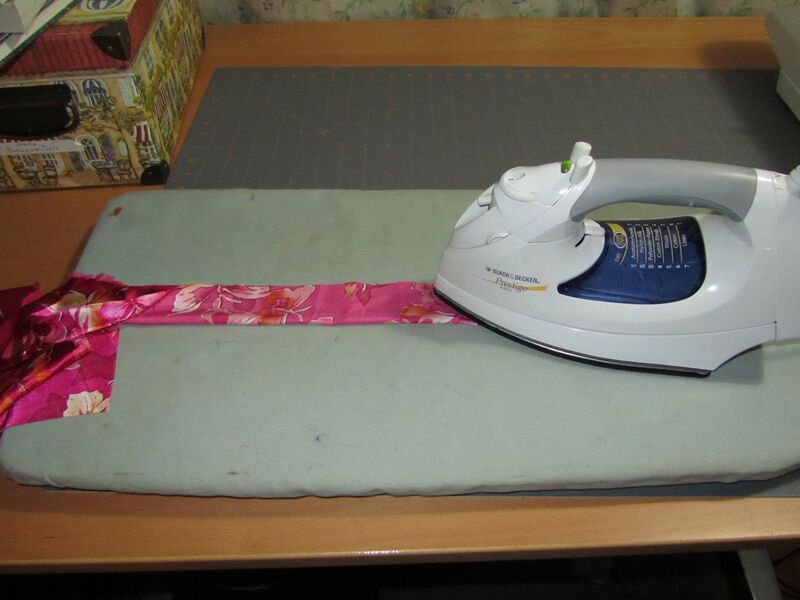 I ironed the strip in half with right sides together. Here, I’m serging the raw edge. I didn’t serge the ends, because I wanted to press it with the seam line in the center of the underside, instead of on an edge. This shows how it looks after serging. 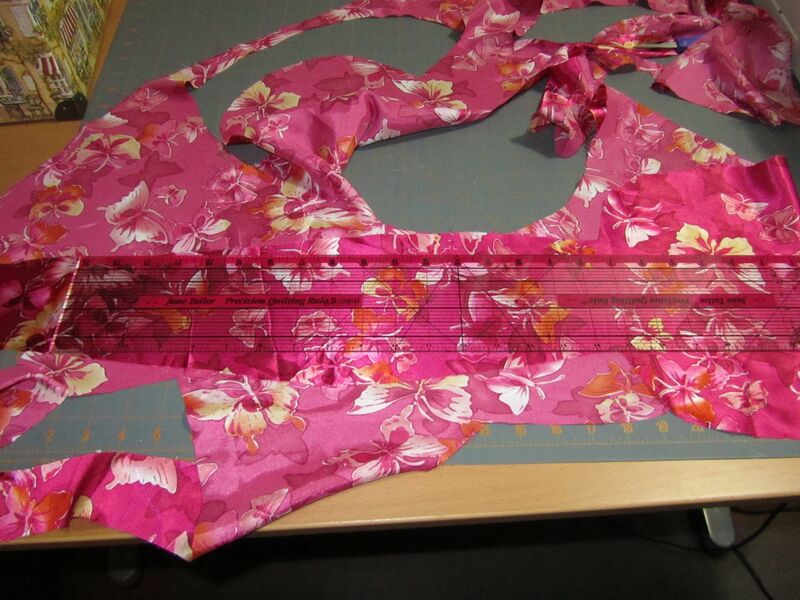 I turned it inside out and pressed it with the seam line in the middle, thus forming the underside. 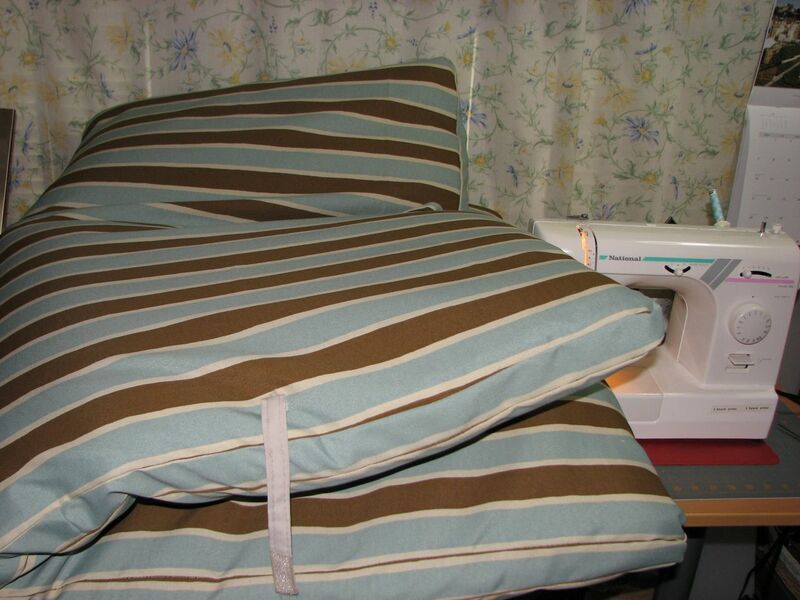 Then, I tucked the ends in and sewed them closed. 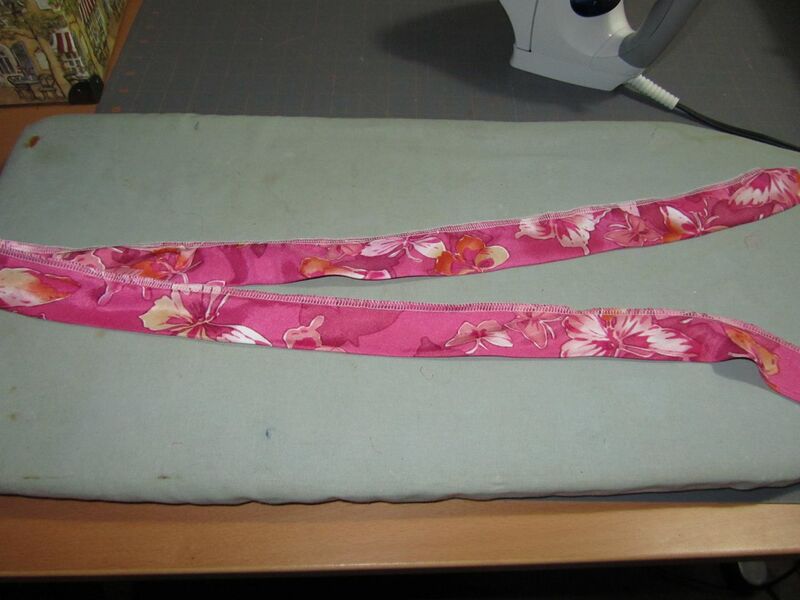 I measured where the headband would normally be tied on my head and sewed snaps there. I recently had the opportunity to make a new cover for a friend’s patio swing. Our local fabric stores had a wonderful selection of outdoor fabric. 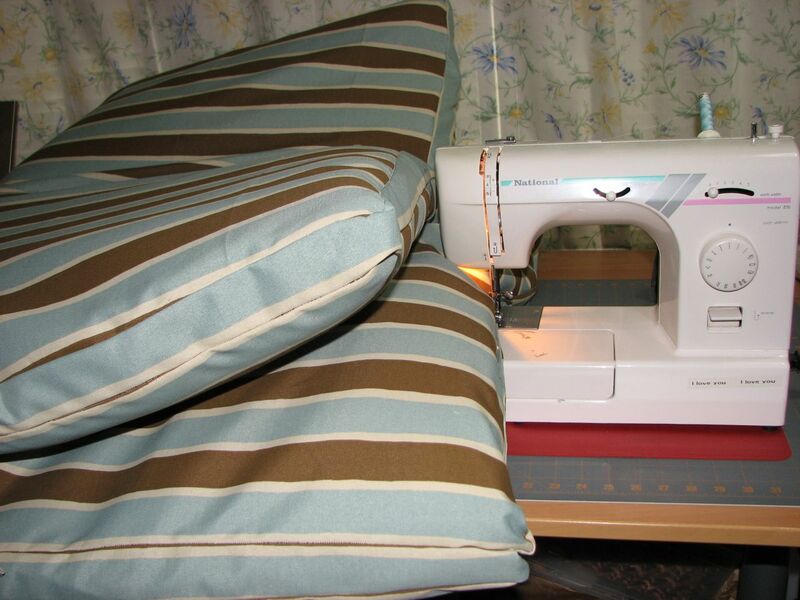 Using striped fabric really made it much easier to cut long strips – one for each side of the cushion, and one to go all the way around the edge. I will say it was interesting to fit the entire thing on my desk! I made new ties for the cushion, but kept the velcro strips, all of which are used to keep the cushion attached to the swing. 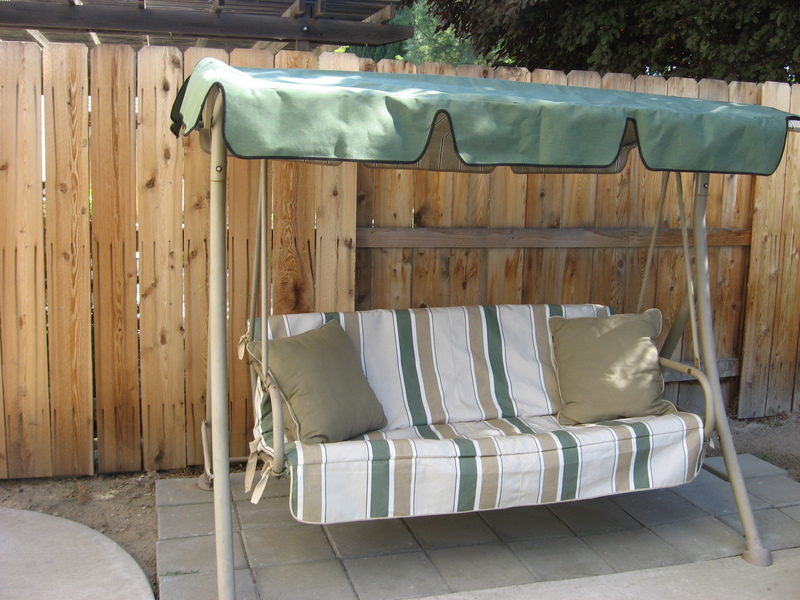 Here is a sample of the type of patio swing my friend has. The cushion is one piece that forms both the seat and the back. 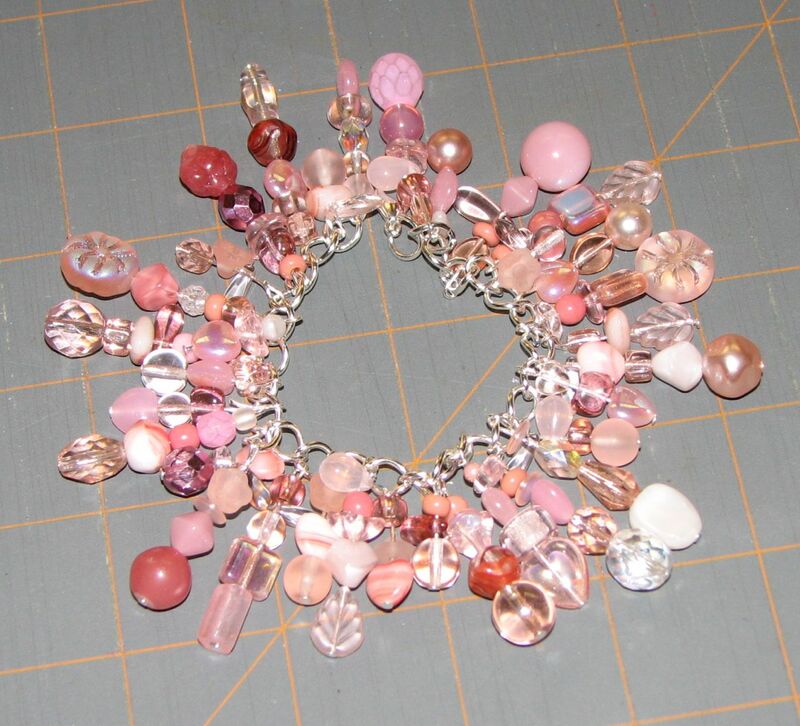 I recently made a pink beaded bracelet. 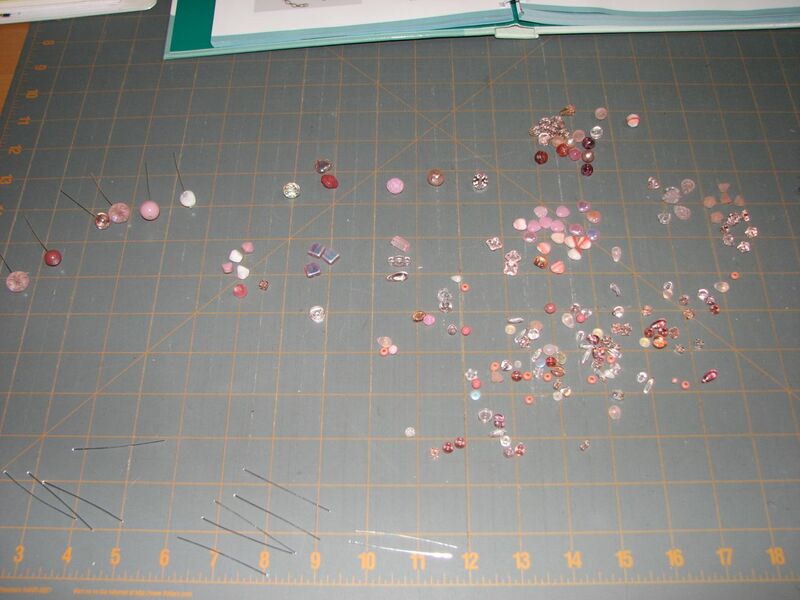 I’ve been learning how to use headpins from a Beading 101 book. First, I roughly sorted the beads by size and design. 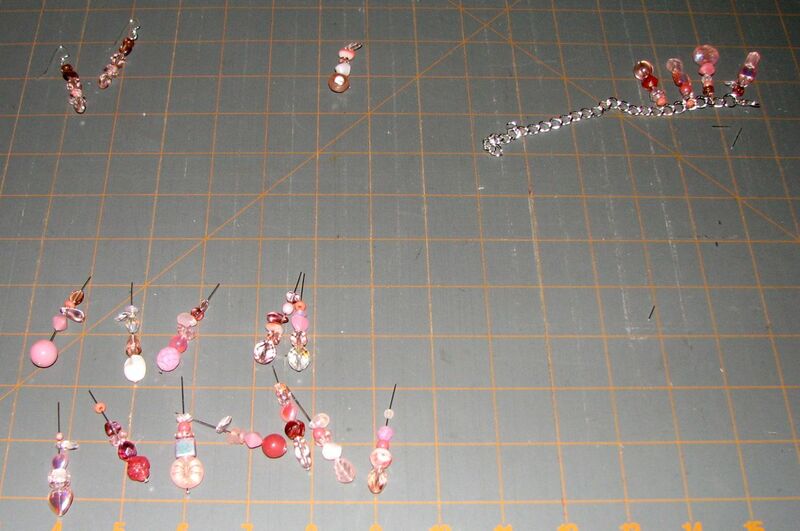 Here, I started randomly combining various beads on headpins. I tried to put large beads on the bottom to keep everything from falling off the headpins. 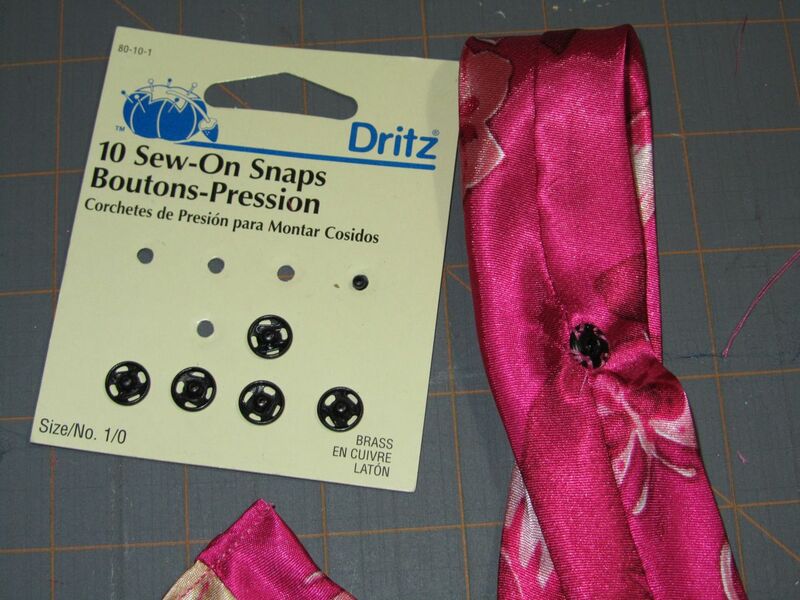 In the top right of the photo, you can see where I started attaching the bead clusters to a bracelet. I found that it looked best with a combination of longer and shorter bead combos. Just to let you know, to make a pair of earrings, just take any of the bead clusters and attach them to the hooks that go through your ears. Here is the finished bracelet!